I’m not religious in the least; Hebrew School dropout and all that. But I felt an overwhelming need to run to synagogue this Yom Kippur, that part of the Jewish New Year where it’s OK to take an entire day to do a full soul scan. 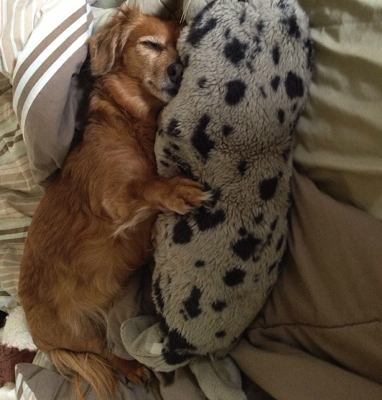 I needed to find out why Ginger, my dachshund, who’d already lived past 18, couldn’t stick around for another 18 years. The killer was that she was still in remarkably good health for what amounted to a 90-year-old. White mask aside (which made her all the more dear), she was still a pup at heart. Up until that heart was deliberately stopped. 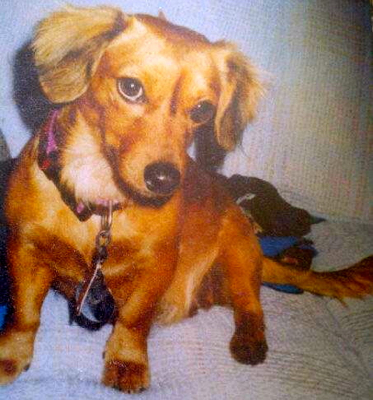 Flashback almost two decades when my Old Girl Baby was found on I-95 in North Carolina, a puppy covered in filth. We think she was abused and abandoned and fending for herself for awhile because she had no collar, went after other animals, and was suspicious of many humans, particularly repairmen types. She’d sometimes go for their ankles. Some might say she was fiercely protective of those she loved. Also true. I admired her more than some humans. She wasn’t one of those simple creatures that was agreeable and loved everyone, though that would have made our relationship a whole lot easier. 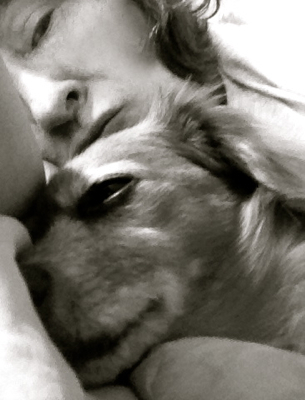 My treasure was multifaceted: fierce and hilarious, sweet and stubborn, tough, but adored her creature comforts. Beautiful in her long-haired doxie imperfections: a goofy cowlick and fur trailing from her ears like an Orthodox Jew. An ear that folded back with a fleecy lining. And meaty forearms like Popeye. She had tremendous presence. She didn’t let anything get her down until the day she couldn’t get up again. Because she was not your average dog, she was misunderstood for much of her life, which made me want to make it up to her every second. She started out with my partner Mitch’s dad. 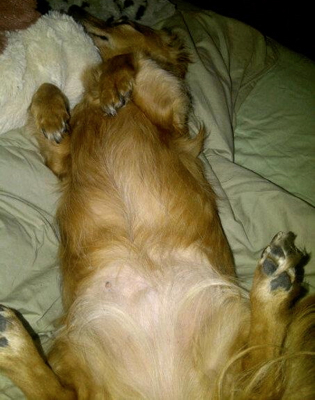 She was a barking, bouncing ball, dubbed “Ginger Bin Laden” by a friend she tried to take a nip at. Most times, the barking would turn to sniffing, and then she’d morph into a penguin on hind legs, begging for cuddles and belly rubs. We realized she was starving for affection. Dad, who’d been used to lap dogs, didn’t get her. After a visit when we’d treat her like a queen, she’d sit in the window watching us leave, with a look that said please take me with you. After dad died, we did. She was middle-aged with a lopsided gait, sign of a bad back made manageable long ago by Prednisone. I loved to kiss that silly cowlick and ask her, as we snuggled, “Are you that doggie in the window?” I was almost sure she knew what I meant. She settled in and took over. It was darn nice of her to let us sleep in her new bed. Since I work from home for a news service, she was a loyal companion and cub reporter. Thankfully, she was perfectly housebroken. But food was another story. She would have made the perfect hunger striker. Dog food? Feh. Human food? Absolutely. You name it, we tried it. Chicken nuggets, Lebanon bologna, fortune cookies, Manchego cheese. We made up a song about her junk-food habit. 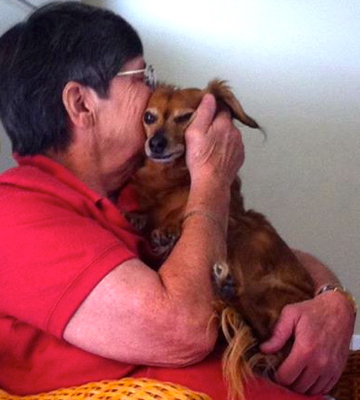 Ginger and our beloved dogsitter, Patty. She had a secret life. When we’d go on vacation, she and her favorite human, our late, irreplaceable dog sitter, would take a joyride to a local burger joint and eat right there. Always inquisitive. 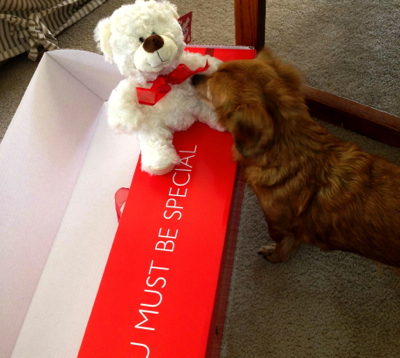 That’s my Valentine’s Day present, Ginger! She was known as the neighborhood loudmouth. But one time, a neighbor’s pug got in her face first. Ginger slunk away, stunned. She was happiest taking a long walk or playing Snoopy on her back. She always had an audience. As time passed and her capabilities diminished we picked up the slack. In her later years her bad back returned to taunt her along with a deteriorating hind leg, kidneys and teeth. Jumping and climbing were out, much to her frustration. She made do with a dog bed. Her life was a stream of intrusions. Doggie diapers, which were short-lived. Carried outside to do her business. Laser pain treatments, injected liquids, endless pills, drops and gels. We wanted her to be comfy. She was. Mellow, in fact. But the puppy was still in there. 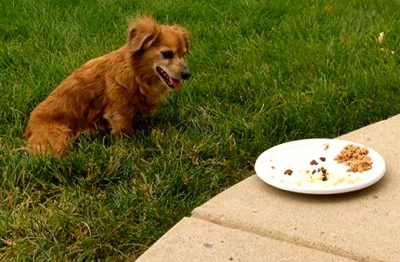 She had slowed so much, we let her wander outside without a leash. One winter night I turned my back. She took off and went a fair distance before I found her. She was well into her 19th year when things really started going downhill. She’d always panted (we nicknamed her our “Carolina Panter”), but it was now more from pain, not enthusiasm. Despite painkillers, she had an increasingly hard time getting up. One day I came home and found her on her side, unable to move, terror on her face. Mitch caught her almost facedown in her water bowl. We kept watch and helped her maneuver. Trying to entice her with a picnic. She was always hungry but with her aches and few teeth, eating was excruciating. She still enjoyed, her meager jaw squeaking when she chewed. Our moral compass oscillated wildly. How was her quality of life? Were good moments still outweighing the bad? An X-ray revealed her spine was better than we thought, though we found out she had a mass in her chest. 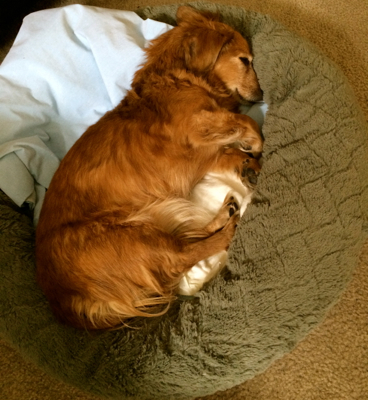 Prednisone was ordered as a last resort for her back and leg pain. 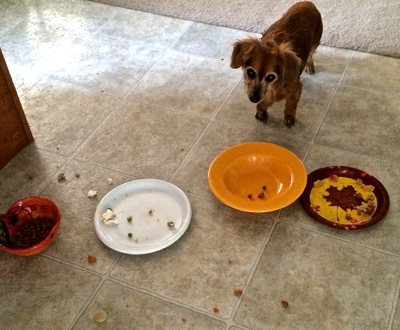 It made her ravenous and peppy. But as bright-eyed and engaged as she was, her mobility was nosediving. Even with the stronger drugs, she could barely move. We asked about a wheel cart to help her get around, but she was too weak. It wouldn’t be fair. We made an appointment to euthanize her that night, still looking for signs that we didn’t need to. Nothing that we could justify in good conscience. Waiting would only prolong her agony. 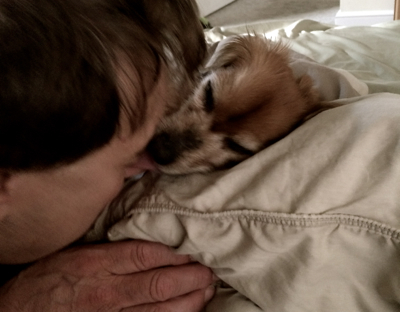 For her last meal, Mitch held her in bed and she showered him with the usual kisses. In between, I fed her vanilla ice cream. At the vet’s, she was shaking as always and we were sobbing. Mitch said he felt like he was letting her down. You’re doing the right thing, we were told. The vet explained the process. When they brought her into the exam room cuddled in a blanket, the IV in her little leg prepped for the fatal drug, I wanted to scoop her up and run away. I gulped down the urge to scream stop. She was gone before the syringe was emptied. We clutched her body, growing cold, as we kissed that cowlick one last time. My heart broke at the sight of her little tongue, slightly protruded. But her pain was gone. Mine was just beginning. We tried so hard to do right by her in life, and in death. She died at the start of Yom Kippur. I’m bordering on atheist, but still so want to believe. So I schlepped myself to memorial services. Pondered a holiday prayer that essentially posed the questions, “Who shall live and who shall die and who shall be at rest”? 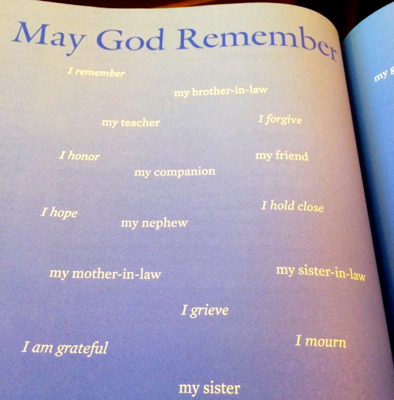 And took comfort in these excerpts from the Prayer for a Beloved Pet offered by my rabbi. we express our deepest gratitude for the blessing of her sweet presence. Through Ginger, we experienced joy. Through Ginger, we learned to think about someone else other than ourselves. Through this beloved animal, we were shown the best qualities of humankind. May we remember to share these important lessons with others. and keep her spirit in our lives. And may I add: When all else fails, eat Lebanon bologna. And keep putting one paw in front of another. This entry was posted in Let's Paws: I break for critters and tagged Dachshunds, dog lovers, euthanizing your dog, Jewish religion, Pets, Yom Kippur. Bookmark the permalink.